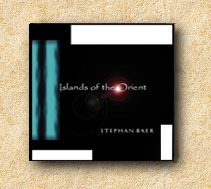 Stephan Baer has travelled extensively around the world, collecting and learning to play many percussion instruments. He's also a wizard in the studio, composing, arranging, performing and producing this entire album. With the exception of some sampled loops, including voices, every sound is Baer's alone. Islands of the Orient is filled with ambient grooves, Baer's hypnotic percussion, and strong Asian and African influences. Listening to this album is like taking an extensive tour through mysterious, exotic landscapes. Keyboards, guitars, voices, and literally dozens of percussion instruments contribute to the haunting sound on this remarkable album.